Redman will push your work! 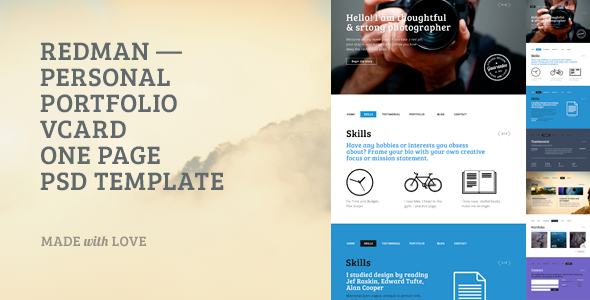 Redman – is a one page PSD template for personal portfolio or vCard. It will perfectly suit the needs of any photographer, designer, illustrator etc. Clean, minimalistic and bold design will push your work. The template consists of well-organized components that are easy to modify. Item Reviewed: One Page PSD Template for personal portfolio or vCard 9 out of 10 based on 10 ratings. 9 user reviews.